Place an oven rack in the middle of the oven and preheat to 350 degrees. Prepare a 12 cup muffin tin by greasing or lining with paper liners. In the bowl of a standing mixer that’s fitted with the paddle attachment, combine the sugar and egg until thick and yellow. Add the vegetable oil, milk and vanilla and beat until well combined. Sprinkle the baking soda, cinnamon and salt over the egg mixture. Add the flour and blend just until moistened. Fold in the zucchini, chocolate chips and walnuts. Fill each muffin cup 2/3 full. Bake at 350 degrees for about 25 minutes or until an inserted toothpick comes out clean. 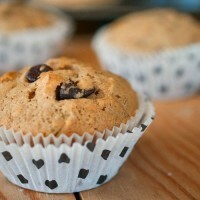 Remove the zucchini chocolate chip muffins from the tin and cool on a wire rack. Store your zucchini chocolate chip muffins in an air-tight container.